When it’s the whole world versus the USA, fingers crossed that this ‘alternate history’ wargame remains alternate. The premise of Fortress America is that the rest of the world is fed up with all our… shenanigans. And forms an all-out assault on our divine providence homeland. I assume there was some political stuff going on around the time was game was released by Milton Bradley in 1986 which would necessitate such a game being made. But I’m American, so I don’t know anything about it. 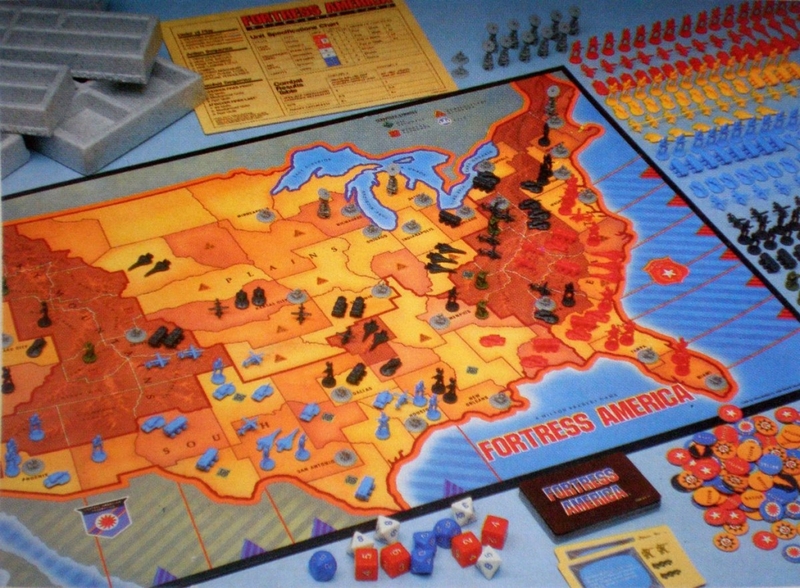 Fortress America is an asymmetric area control wargame with dice rolling and card drawing mechanics. The goal of America is to wipe out all opposing forces. The goal of the opposing forces is to work together to wipe out America. We manifest destiny’d this land fair and square. Fortress America is actually a very well balanced game. 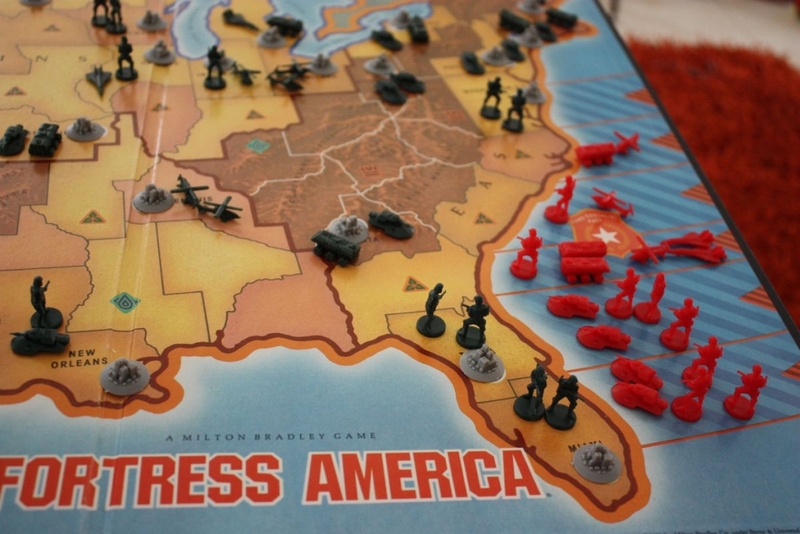 In the initial stages of the game, America is vastly overwhelmed by invading forces. They will lose a lot of land in the first few turns. 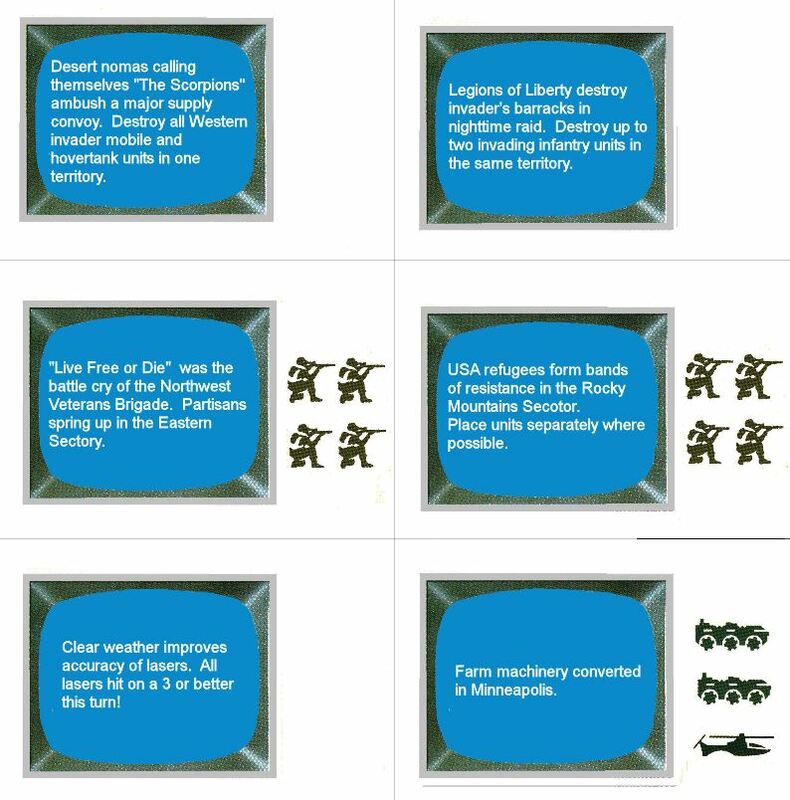 However, as the game progresses, they will start to gain more reinforcements and (hopefully, for the sake of Freedom™), push back the invaders. 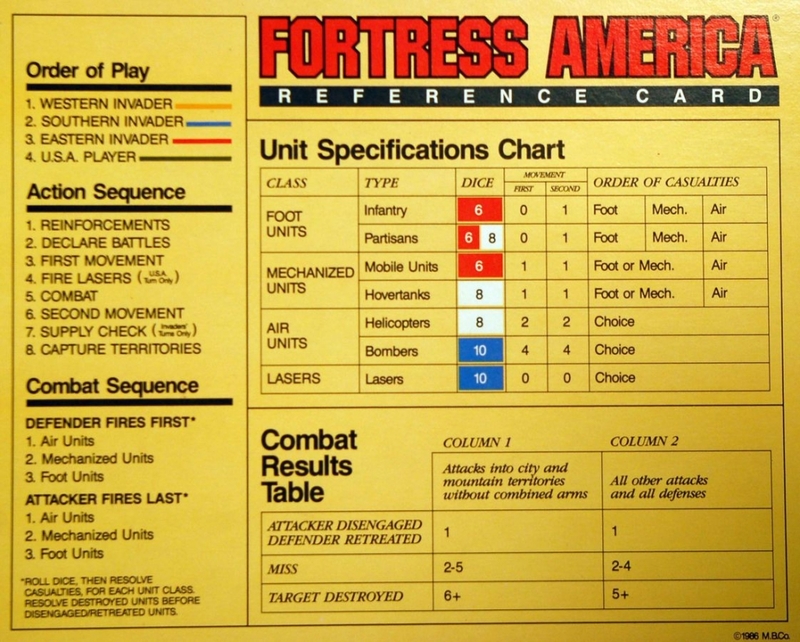 The general gameplay follows a simple combat chart with a few interesting caveats. If any force has at least 1 unit from each class (Foot, Mech and Air), they are deemed to have ‘combined arms’. In these cases, they will have advantages on attacks, as noted in the Combat Results Table. This makes diversifying your forces, and properly deploying them where they are most needed key towards victory. Throughout the game, players will draw Partisan cards, which will grant an in-game effect as well as the occasional additional units to deploy. Sometimes the card with dictate where the units can be deployed, but not always. The silhouettes show which units America gains. The invading forces gain new units at regular turn intervals. Each military force will push against the other until there is nothing left to push. 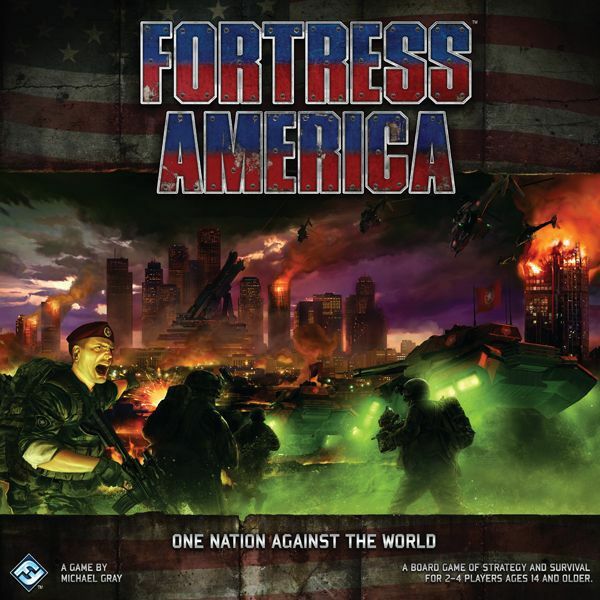 Fortress America takes a well established genre and adds a few new twists to make it interesting. The 3 versus 1 aspect is definitely something you don’t see very often. And the aspect of combined arms is something I’ve never seen before at all. 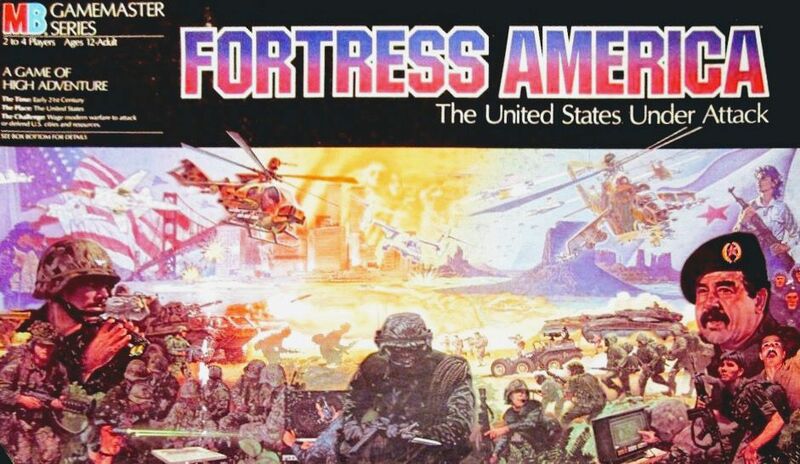 Overall, Fortress America is pretty solid game and even got a 2012 re-release by Fantasy Flight Games.